For this week’s Why Richmond, Why?!? column on Richmond.com, I linked back two opinion pieces that dealt with people mistreating the James River and the James River Park System in Richmond. Two years ago, I wrote the Top 10 Ways Richmonders Are Ruining the James and the Top 10 Ways Richmonders Are Helping the James and I think both are still applicable today. We can do better caring for the environment and no amount of policing or hiring more park staff would help if park-goers themselves aren’t willing to take ownership of the parks and be a part of the solution. I find it very invigorating to clean trash and remove signs of man’s interference with Mother Nature wherever I go, but in particular, I have a strong sense of pride in helping preserve the James River Park. 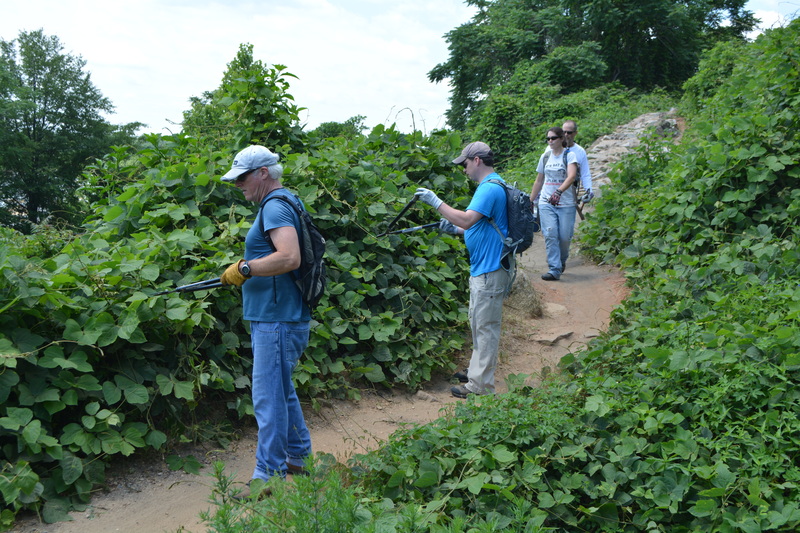 I spent time this past weekend with 40 volunteers from Richmond MORE on National Trails Day, clipping back overgrown tree limbs and weeds on the JRPS trail loop and loved doing my part and giving back.